Heat gas or charcoal grill. Line microwavable plate with microwavable paper towel. Place bacon on plate; cover with microwavable paper towel. Microwave on High 2 minutes or until limp. Cut each slice in half crosswise; set aside. Cut lengthwise slit in each pepper, leaving stem end intact. Spoon about 1 teaspoon cheese into each pepper. Wrap 1 piece of bacon around each pepper, securing with toothpick. Place peppers on grill over medium-high heat. 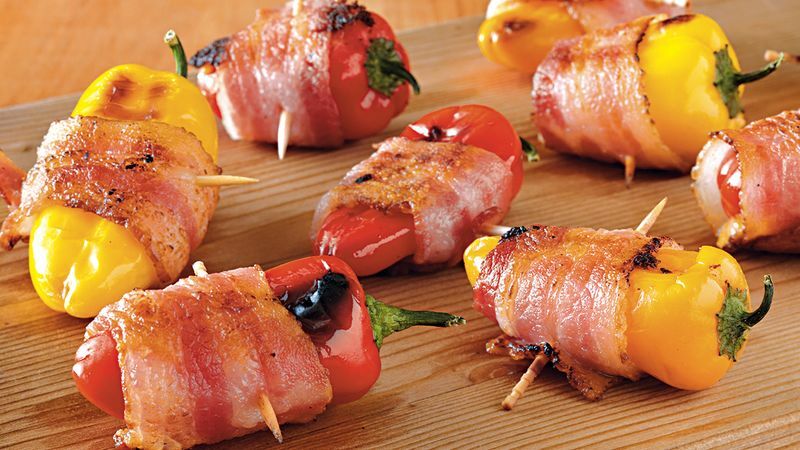 Cover grill; cook 6 to 8 minutes, turning often, until bacon is crisp and peppers are slightly tender. Serve warm. To prevent ends of toothpicks from burning on the grill, submerge toothpicks in water for at least 30 minutes before using.